Livewire of Bollywood- Ranveer Singh and the cutest female star Alia Bhatt will soon be seen in an Ad. They were snapped while shooting in Mumbai and pictures from the shoot have gone viral on social media. 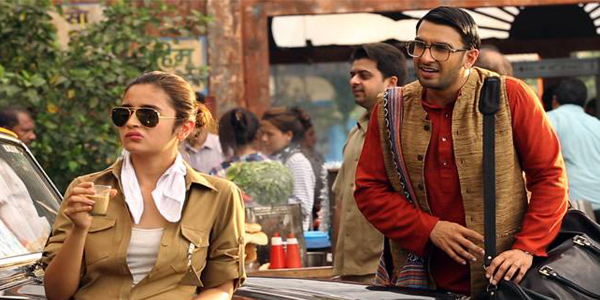 In one of the picture Alia is dressed in as a taxi driver with aviators and is seen sipping cutting chai, as Ranveer is dressed in kurta pyjama complete with a geeky look, approaches her. In another picture, Alia is seen in a red hot sari while Ranveer is dressed as his usual colourful self, are seen sitting across the table. This will be the first time that both these star will be seen on screen. There is not much information about the Ad and star cast..hope to get them soon. Regards career basis, Alia will be seen in ‘Kapoor And Sons’ that will hit screen on March 18. She will be seen opposite Sidharth Malhotra, Fawad Khan, Rishi Kapoor and Ratna Pathak Shah. While Ranveer is busy with the Aditya Chopra’s ‘Befikre’, that features actress Vaani Kapoor opposite him.